History is larger than life - and twice as funny - in this monumental comedy sequel that’s “better than the original” (At the Movies)! Ben Stiller leads an all-star cast (including Amy Adams, Owen Wilson, Hank Azaria and Robin Williams) as Larry Daley, a former night watchman at the Museum of Natural History, where the exhibits come to life after dark. But now Larry’s nocturnal friends are being retired to the archives of the Smithsonian Institution, luring him back for a hilarious, all-out battle against museum misfits who plan to take over the Smithsonian ... and the world! $70.052 million on 4096 screens. Blessed with a fun – if derivative – concept as well as a nice mix of action and comedy, 2006’s Night at the Museum became a massive hit. When a movie earns $250 million and turns into its year’s second-biggest hit, it usually will spawn a sequel. That’s especially true when the idea behind the flick offers nearly limitless opportunities for exploration. Because of this, 2009’s Night at the Museum: Battle of the Smithsonian became virtually inevitable. 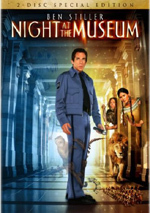 When we last saw Larry Daley (Ben Stiller), he worked as a night watchman at the New York Museum of Natural History. Since then, however, he developed a successful Ronco-style business called Daley Devices. This occupies all his time, so he rarely has the chance to visit with his old pals at the museum. Larry returns once more when he learns that the museum will go high-tech; replaced by fancy-pants displays, virtually all the physical exhibits will be crated and shipped for storage in the archives underneath the Smithsonian Institution in Washington DC. It looks like Larry’s friends will remain immobile for eternity, though; the ancient tablet that brings them to life every night is supposed to stay in New York. “Supposed to stay” being the operative term, as cheeky Capuchin monkey Dexter steals the tablet and takes it on the journey from NYC to DC. This ultimately brings to life Kahmunrah (Hank Azaria), an Egyptian tyrant who plans to use the tablet to rule the world. After Larry hightails it to DC to save the day, plenty of wacky antics ensue as our hero pairs with Amelia Earhart (Amy Adams) and his old pals. While the original Night didn’t dazzle, it provided an enjoyable effort. Most of the gang returns for Battle; from director Shawn Levy to writers Robert Ben Garant and Thomas Lennon to significant cast members Stiller, Robin Williams, Owen Wilson and others, Battle feels like old home week. With so much of the original’s talent back in tow, it becomes a surprise to discover what a limp, lifeless piece a work Battle offers. Oh, it features all the right components. It takes a good cast and adds talents like Adams, Azaria and Christopher Guest. It gives us a nice expansion of the first movie’s setting, as the Smithsonian boasts many great opportunities for delightful comedy and action. Alas, Battle never manages to develop either its humor or its thrills to a satisfying degree. As I watched it, I constantly thought that I should feel entertained, but I rarely reached that state. Most of the time I remained fairly detached from the events. I viewed them from a distance and never became immersed in anything on display. None of this makes Battle a bad film, but it does mean that the movie lacks much charm or vivacity. Though it boasts all the requisite pieces, they never gel. The end result seems almost robotic, like a machine made it. It usually feels like some sort of sequel-writing program came up with the script, and animatronics shot it. Maybe that’s true, as I’m not sure how so many talented people could make such a lifeless film. I can see how qualified folks make bad movies; as a great man once said, it’s a fine line between clever and stupid. But actively awful films often show passion – they just suffer from misguided passion and they end up terrible. So I could understand if Battle had been a big old smelly pile of poop. I can’t figure out how it turned out to be so unrelentingly blah, though. It’s not devoid of any humor, thrills or charm, but all of these seem to be in fairly short supply. Battle is too bland and forgettable to make a mark. Night at the Museum: Battle of the Smithsonian appears in an aspect ratio of approximately 2.35:1; the image has been enhanced for 16X9 televisions. Given the limitations of the DVD format, the film looked pretty good. For the most part, sharpness satisfied. Virtually all close-ups and two-shots appeared well-defined and accurate, and some wider elements worked fine as well. However, more than a few of those wider images could be rather soft and fuzzy. That inconsistency became a distraction, though I’d say that most of the film displayed decent to good delineation. No issues with jagged edges or shimmering occurred, but I noticed mild edge enhancement at times. Source flaws weren't a problem, and the presentation lacked significant signs of digital artifacts, mosquito noise or other distractions. Like the first film, Battle went with a warm, golden tint. I thought the colors could appear a bit dense at times, as they lacked the consistently vivacity I’d like. Nonetheless, they remained perfectly acceptable most of the time and usually looked fine. Blacks were dark and deep, while shadows demonstrated nice clarity. This became a generally positive presentation. As for the Dolby Digital 5.1 soundtrack of Battle, it boasted just enough action material to make it succeed. This wasn’t a super-spectacular kind of film, however, and I thought it downplayed action more than the first flick – at least for its first half or so. The story provided a wider array of engaging pieces as it progressed, but it lacked the consistent spread and involvement found during the original movie. No matter: Battle still made nice use of the various channels. The wilder battle/chase sequences offered the best material, as they moved elements all around the spectrum in a satisfying way. Quieter scenes also provided a nice sense of ambience. The surrounds didn’t get a tremendous workout much of the time, but they managed to enhance the environment and contribute to the presentation. I discerned no issues with audio quality. Music appeared vivid and brassy, and speech seemed distinctive and concise. Effects became the most interesting part of the mix. They were consistently tight and dynamic, so they added oomph to the film. Because the track could be subdued for fairly long stretches, I thought it fell into “B+” territory, but I couldn’t find anything serious to criticize here. When we move to the set’s extras, we open with two separate audio commentaries. First we hear from director Shawn Levy, who offers a running, screen-specific chat. He discusses the film’s development and sequel-related challenges, cast, characters and performances, sets and locations, editing, story/tonal areas, and a mix of effects. Perpetually chipper, Levy dishes no dirt here. Although Levy mocks himself at times, he remains relentlessly positive about everything else. Despite the high “Happy Talk Quotient”, Levy still provides a solid commentary. He gives us plenty of good notes about the movie and its creation. This turns into a consistently enjoyable chat. For the second commentary, we go to screenwriters Robert Ben Garant and Thomas Lennon. Both sit together for their running, screen-specific look at script/story areas and changes, sets and locations, cast and performances, and a mix of movie-related experiences. At times, Garant and Lennon touch on material already discussed by Levy; the director offers the superior take on the production. However, they give us a more entertaining viewpoint, as they provide plenty of funny bits. They throw out a mix of humorous sequel ideas and make this a fun piece. Next comes a program entitled The Curators of Comedy: Behind-the-Scenes of Night at the Museum: Battle of the Smithsonian. In this 19-minute, 57-second show, we hear from Levy, production designer Claude Pare, and actors Ben Stiller, Amy Adams, Robin Williams, Bill Hader, Hank Azaria, Chrisopher Guest, Steve Coogan, Owen Wilson, Ricky Gervais, Jon Bernthal, and Alain Chabat. They chat about sets and shooting at the Smithsonian, cast, characters and performances, and Levy’s work on the set. “Curators” has some charms, but boy is it fluffy! The actors tell us a little about their work, but mostly they joke. We also learn how wonderful the movie will be. Pare does give us a nice tour of the set and props, at least. This is a reasonably entertaining show, but it lacks much substance. Six Deleted Scenes fill a total of 11 minutes, 29 seconds. These include “Brunden: The Director’s Cut” (5:38), “World Twister” (1:14), “How Many Bad Guys Can You Fit In an Elevator?” (0:46), “Moon Rover” (1:33), “Takin’ ‘Em Down, Gangster Style” (1:13) and “Alternate Ending” (1:05). While we don’t lose any comedy gold here, some of these are reasonably entertaining. “Brunden” goes on so long that it actually becomes funnier due to the absurdity. The others are less interesting, though I like the confrontation between young and old versions of Capone. Although the “Alternate Ending” isn’t hilarious, it really should’ve made the final cut. It offers a fun cameo by a few actors from the first movie. Why bring them in and them abandon them? I think the scene definitely should’ve stayed. We can view all of these clips with or without commentary from Levy. He tells us a little about the sequences and sometimes lets us know why the scenes didn’t make the theatrical release. He doesn’t chat as much as I might like – at least during “Brunden”, where he abandons us quickly since he already discussed it in the main commentary – and he also doesn’t provide as much info about why he chose to omit the segments. Yes, we get those details at times, but that data should always appear. Levy remains interesting, but he doesn’t always do his job. A Gag Reel runs eight minutes, 11 seconds. A typical blooper set packs little more than silliness and mistakes, and some of that sort of material appears here. However, we get plenty of alternate lines and improv bits. Those make the “Gag Reel” significantly more entertaining than usual. Two more featurettes follow. Phinding Pharaoh lasts four minutes, 50 seconds and provides notes from Levy and Azaria. They discuss the path to Azaria’s performance, and we hear the actor’s unused ideas. Those test clips make the clip fun to see. The Jonas Brothers in Cherub Bootcamp goes for three minutes, 53 seconds. It includes remarks from Levy, Stiller and actors Kevin, Nick and Joe Jonas. It’s really a goof; it purports to show Levy as he badgers the Jonas Brothers into a good cherub performance. It’s cute and mildly entertaining. A few ads open the disc. We get clips for Avatar, Alvin and the Chipmunks: The Squeakuel, Percy Jackson and the Olympians: The Lightning Thief, Ice Age: Dawn of the Dinosaurs, and Flicka 2. Under Trailers, we get ads for “Family Favorites”, Aliens in the Attic, Space Chimps 2 and Glee. No trailer for Battle appears here. 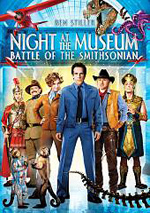 I’ve certainly seen worse sequels than Night at the Museum: Battle of the Smithsonian, but it remains a disappointment. 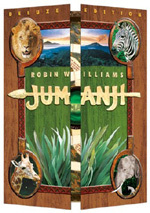 The movie offers mild excitement/amusement at best; most of the time it seems bland and lifeless. The DVD provides pretty good picture and audio along with a collection of extras highlighted by two interesting commentaries. This is a fairly nice release for a forgettable film.